When Numbersixvalverde won the 2005 Irish Grand National he ensured his place in history, not only as winner of that famous race, but also as the horse that gave Ruby Walsh the distinction of being the only jockey to capture the Fairyhouse contest in the same season as the John Smith’s Grand National and Coral Welsh National. He made his racecourse debut at Leopardstown’s Christmas meeting in 2001, finishing 20 lengths second to Alexander Milenium, and ran a further three times in bumpers that term without success. He made his hurdling bow at Fairyhouse in November, 2002, finishing second and was runner-up on his next start too - his sixth such finish in his first eight outings - before opening his account in a heavy-ground maiden hurdle at Punchestown on New Year’s Eve. He was again second, this time to the smart Florida Coast, at Fairyhouse in January, before running third to Jack High a month later. He did not race again until February 2004 and in five starts that spring, failed to add to his solitary success. A switch to fences at the beginning of the 2004/2005 season failed to bring immediate rewards. He was last of eight in a Grade Three at Tipperary in October but improved when a second to Crane Brake in a beginners’ chase at Galway three weeks later, and was then third to Keepatem in November. Stepped up to three miles at Navan in December, Numbersixvalverde gained a deserved and overdue second victory. Fifth in the Paddy Power Handicap Hurdle was followed by another winning effort in the Thyestes Chase in January, and the following month he was a close third to Point Barrow in the Grade Three Ten Up Novice Chase at Navan. That effort preceded his famous defeat of Jack High in the Irish Grand National and he rounded off the campaign at the Punchestown Festival where he was fifth to Pay It Forward in the Betfair.com Handicap Chase. This season began back over hurdles at Navan, running eighth behind Nicanor on November 13. He was fourth in a Fairyhouse handicap hurdle the following month, and was then brought down when in contention five out in the Paddy Power Chase at Leopardstown on December 27. He returned to that track on January 15 for the Pierse Leopardstown Handicap Chase and was a staying-on fourth to What A Native. His last two outings have been in handicap hurdles, finishing fourth to Dead Sound at Punchestown on February 5, and an eye-catching third behind Leaders Way at Naas on March 12. 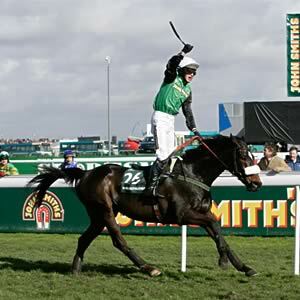 Today he won the John Smith’s Grand National in good style. Born in Ennis, County Clare, where his late father Tommy Carroll was prominent in local business circles, Bernard Carroll has made his name as a Dublin property developer. He has had horses with trainer Martin Brassil since the Curragh handler began training in the mid-90s and the pair enjoyed their first success together when Section Seven won a Leopardstown Bumper under Tony Martin in March 1995. He named his most famous horse, Numbersixvalverde, after his holiday home on the Algarve, Portugal. He was in Portugal at the time of the horse’s biggest triumph in the 2005 Irish Grand National, having booked his vacation some months previously, and believing that any alteration to his plans could tempt ill-fate. He also has horses with County Louth trainer Harry Rogers. Martin Brassil, who hails from the village of Newmarket-on-Fergus in County Clare - named by Lord Inchiquin after the racecourse in England - started working with ponies at the age of 19. Currently based at Dunmurray in County Kildare, where he trains around 15 horses, 49-year-old Brassil is a former amateur rider who worked for Mick O’Toole and Neil McGrath before starting up on his own. He took out his first trainer’s licence in 1994, and his first winner came when Section Seven, owned by Bernard Carroll, landed a bumper at Leopardstown, on March 5, 1995. The pair would team up again to great effect 10 years later with Numbersixvalverde. His first big success came in the Thyestes Chase at Gowran Park, where in a thrilling finish, he just got the better of Kymandjen by a short-head. Better was to follow, as he went on to take the Irish Grand National at Fairyhouse, edging home by three-quarters of a length from Jack High. It was a first runner in the race for the pair, and the victory meant that Numbersixvalverde became the first horse to win both the Thyestes Chase and the Irish Grand National in the same season since Brown Lad in 1976. Carroll, a property developer, named the horse after his residence in Portugal, although he missed the horse’s Irish National triumph having been in Portugal at the time! So far this season, Brassil has trained eight winners (as of March 28), the highlight being Nickname’s striking 11-length victory in the Grade 2 Paddy Fitzpatrick Memorial Novice Chase at Leopardstown, on January 15. His brother John is also a trainer. Niall Madden's father was never called Niall, universally known as 'Boots' Madden from his days as a young jockey at Edward O'Grady's yard when his boots were always too big for him. If the father is Boots it is hardly surprising that the son has become 'Slippers' Madden, and his father readily admits that Slippers is better at the game than he ever was.Slippers was a racing prodigy, his first winning mount coming in a handicap hurdle at Wexford on July 12, 2002, when he was just 16. The horse was a French-bred called Teknash, trained by his father. His second win came on the same horse 19 days later at Galway, and when he rode his third victory, on a J P McManus horse called Live Our Dreams at Naas, he was already being marked out as a star of the future. In his first season as an amateur, Madden had 10 winners, while he more than doubled that total the following year with 28 winners. His final season - the 2004/05 campaign - as an amateur was his best, his 39 successes earning him the Irish amateur crown. His most notable victory that season came when he partnered Numbersixvalverde to victory in the Thyestes Chase in January, becoming the first amateur to win the Gowran Park showpiece. It was not the first time that Madden had partnered his Grand National mount, that was at Navan in December, 2004, when the horse, running in his first handicap chase, was a comfortable winner. Madden has now ridden the horse in eight of his last 12 races, but missed the biggest success, when Numbersixvalverde won the Irish National last March at Fairyhouse ridden by Ruby Walsh. This season, as second jockey to Noel Meade, Madden has already clocked up 29 successes, and now has over 100 career wins. Madden, who will not be 21 until November, is having his first ride in the John Smith’s Grand National and has never ridden a winner in Britain. His father rode in the race several times, enjoying his best placing when Attitude Adjuster finished fifth behind Rhyme 'N' Reason in the 1988 race.